LanTalk NET 3.3.5273 is chat & instant messaging software developed by CEZEO software Ltd..
LanTalk.NET office instant LAN messenger that work in LAN, WAN or Internet, without any server or internet access! Designed for business networks. In fact, in most companies LanTalk.NET replaced corporate e-mail for exchanging files and messages. For an additional fee you will get a custom version of LanTalk.NET. This communications software is shareware, which means you can download and use LanTalk NET 3.3.5273 for free during the trial period (usually for 30 days). At the expiration of the period you will have to buy the chat & instant messaging product for $17.95. LanTalk NET 3.3.5273 is available at regnow and CEZEO software Ltd. website. 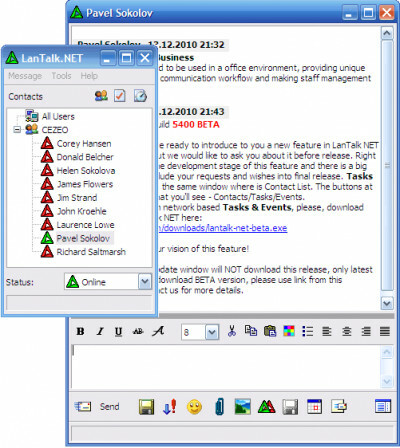 LanTalk NET 3.3.5273 supports English, German, Russian, French, Italian, Spanish interface languages and works with Windows 98/XP/Vista. We have tested LanTalk NET 3.3.5273 for spyware and adware modules. The software is absolutely safe to install. Our website has thoroughly tested communications product LanTalk NET 3.3.5273, written the review and uploaded installation file (929K) to our fast server. Downloading LanTalk NET 3.3.5273 will take several seconds if you use fast ADSL connection.